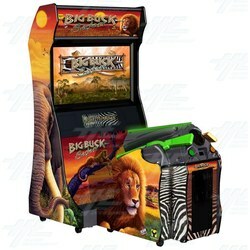 Big Buck Safari is big game hunting simulator with an African safari theme. Big Buck Safari features an extra 38 different animals to hunt, and improved High Definition graphics. In Big Buck Safari players go on a big-game hunting safari across Africa. There are 15 different hunting treks, with locations including desert dunes, grassy savannas and lush jungles. Players hunt animals including Gemsbok, Kudu, Sable, Cape Buffalo and Wildebeest. There are also trophy animals which increase your score significantly. Animals include Lions, Leopards, Rhinos, Giraffes, Buffalo, Zebras, Elephant, Hippos and Panthers. There are also new critters to hunt including Frogs, Hyenas and Meerkats to name a few. In Big Buck Safari players go on a big-game hunting safari across Africa. There are 15 different hunting treks, with locations including desert dunes, grassy savannas and lush jungles. Players hunt animals including Gemsbok, Kudu, Sable, Cape Buffalo and Wildebeest. There are also trophy animals which increase your score significantly. Animals include Lions, Leopards, Rhinos, Giraffes, Buffalo, Zebras, Elephant, Hippos and Panthers. There are also new critters to hunt including Frogs, Hyenas and Meerkats to name a few.